Ever since this morning, political obsessives have been scrambling to find out any bit of information they can on Evan McMullin, a little-known former CIA officer who has decided to run for president on a platform vaguely similar to the one that Mitt Romney ran on in 2012. With no name recognition and no executive experience, there is no chance that McMullin could win. But that isn’t the point of the exercise. 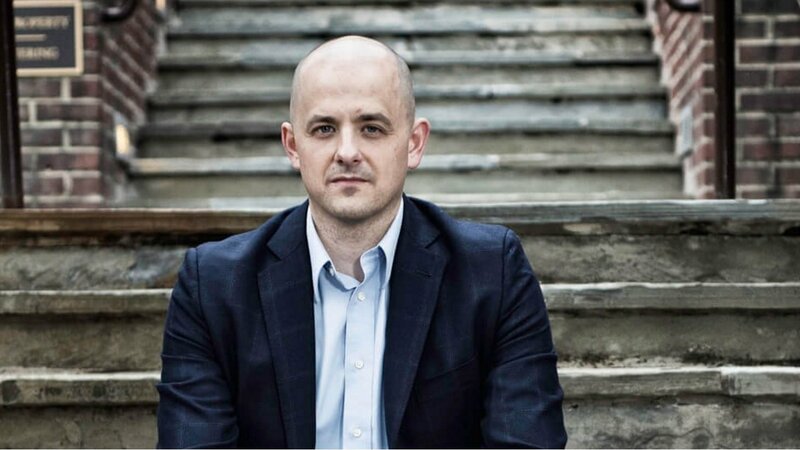 The McMullin candidacy, which is being pushed by the remnant of the NeverTrump movement, appears to be designed with several key goals in mind: 1) Prevent Donald Trump from getting a majority in the Electoral College, 2) Promote a hawkish foreign policy, and 3) Motivate disgruntled anti-Trump Republicans to show up to vote for down-ballot Republican candidates. The first goal was spelled out last month in a lengthy blog post by Stu Burguiere, a co-host of radio pundit and doomsday prophet Glenn Beck. In the essay, Burguiere lays out an elaborate fantasy scenario which he calls “the election bailout plan that could save us from both Trump and Hillary.” In his proposal, Burguiere argues that a fifth-party conservative spoiler candidate could actually do well in some deep-red states where the residents strongly disagree with Democrat Hillary Clinton as well as Donald Trump. There are almost no such states since the overwhelming majority of Republican voters say they support Trump. But there is one region of the country rich in the voters that Burguiere describes: the inter-mountain west region centered around the state of Utah, one of the very few states in which Trump’s final principle rival Ted Cruz actually managed to defeat him soundly. The one thing the three states Burguiere targets—Utah, Idaho, and Wyoming—have in common besides a lot of mountains is that they have lots of Mormon residents in comparison to their general populations. That fact seems to have been what won the day for Evan McMullin among the remnants of NeverTrump since he, like many of the residents of the three states in question, is a Mormon. He even went to the faith’s well-known college, Brigham Young University. It’s still a long uphill climb for McMullin to win any of these states but there is at least the possibility that he could throw them to Hillary Clinton. All three, in fact, have a history of voting for Democratic governors despite their Republican reputations. As late as 2013, Utah’s second federal congressional district was represented by a Democrat. Wyoming had a Democratic governor as late as 2011. All three have shown a willingness to vote for third-party candidates without a prayer. Even if he doesn’t manage to make much of a dent, the very existence of the well-funded McMullin candidacy is almost certain to have an impact on the Republican electorate. Anyone can see this by heading over to large conservative communities like Free Republic where the members are positively incensed at McMullin’s bid and at the people backing him. Free Republic is an interesting case because, by and large, its members are more conservative than the Republican Party and also a majority of the membership took a long time to come around to support Trump during the GOP primaries. Initially, Anybody-But-Trump was the leading candidate with many favoring Ted Cruz. Since Trump became the presumptive nominee, however, Free Republic has closed ranks and began backing Trump to the hilt. The grassroots Right seems to be responding to the McMullin candidacy the same way they did to Ted Cruz’s refusal to endorse Donald Trump at last month’s GOP convention: hot anger at an insider who won’t abide the people’s choice. “His first step needs to be taking a long walk off a short pier,” advises member headstamp 2. I could go on but I won’t. Essentially, a huge part of the Republican voting base, many of whom did not support Trump during the primaries, sees the McMullin candidacy as a betrayal on the part of Washington Republicans. It’s not difficult to imagine that they will neither forgive nor forget it, especially if he manages to flip a state to himself or to Hillary Clinton. There’s no chance that McMullin could somehow be elected through a U.S. House vote (that’s the ultimate goal of Burguiere’s fantasy above). But the former CIA and Goldman Sachs employee just might manage to blow up the Republican Party’s shrinking electoral coalition. Well, Trump voters, […] I’m not going to coddle you and say you’re really smart and good people and this is just a misunderstanding. That’s just what the PC crowd does on the left. Trumpkins don’t deserve a participation trophy for wrecking the party and saddling the nation with Hillary. They made the crazy the enemy of the good, and centered an entire campaign on rage, fear and an eternally shrinking spiral of cult-worship and fanaticism. They dragged one of America’s great political parties from the back of a truck. So when it’s over, Trumpkins, remember: You’re not purging us. We’re purging you. Even before the McMullin gambit, the prospect of a Trump general election victory was quite low. Given that anti-Trump Republicans couldn’t muster enough votes to defeat him with only two other opposing candidates, however, it’s quite possible that Trump-supporting GOPers just might be the ones doing the purging. If you thought that the turmoil within the American Right was going to die down after 2016, welcome to the new reality. Someone just poured gasoline on the Republican Party. Only time will tell who survives. LMBO…who is this guy? Nobody knows him and nobody cares about him! I’ve never heard of this guy but I can guarantee you, anyone who is affiliated with him like Wilson or Billyboy Kristol is dead to me. I don’t care what policies they pretend to support. Conservatives have been told to sit down and shut up by GOP elites for decades. They won’t follow the same procedures they ask us to. Uh, not even close. A large majority of FReepers supported Trump right out of the gate, and have been supporting him ever since. There WAS a tiny VERY VOCAL group of trolls (about 3-dozen) being paid by someone to create havoc by activating old, sleeper accounts and pretending to support Cruz and viciously attacking Trump supporters; however, the moment Trump received a majority of the delegates in the primary, those few were kicked out and all has been peaceful regarding Trump since then on FR. Keep in mind that Free Republic has purged a significant portion of their members when they changed from a conservative forum to a Trump fanboy forum. The opinions there no longer represent the conservative base. You’re dead wrong about Free Republic supporting Trump only after he became the nominee. There was a vocal Cruz contingent posting during the primaries, but their numbers were VERY SMALL. This is quantifiable, given that there were daily polls posted at the site during the primaries and the Trump vote among FR membership towered 5-to-1 over the Cruz vote every day. So Rick Wilson finally found someone to be his cardboard cutout. I should’ve figured he’d find a way to get paid this year. One major problem with this, Free Republic hasn’t been ‘Conservative’ in more than a decade. It is mostly been reduced down to a political version of 4Chan where trolls from Democratic Underground see how much they can rile up the old church ladies who are still there, barely getting in with the last vestiges of dial up internet service. They just had a huge purge of anyone who doesn’t support (or pretend to support) Trump 100%, banning over 400 members in a couple of months. Using Free Republic as an example of a Conservative forum is like using Landover Baptist as an example of Christians. I will leave the Republican party after the election. Mitt Romney and Paul Ryan have ruined our party. Shame on them ! I will vote for Trump in November for sure!! The Never TRUMP Republican should LEAVE the Republican party. What a shame that we have these stupid people in Congress. We as tax payers are paying them big money to play these games. They are doing nothing but wasting our money. I will work hard to make sure that they ALL loose their jobs! We now have a list of over 26 Million American who have signed against these NEVER TRUMP Republican. Their day is right around the corner ! A book is being written and we are naming them all. I have no idea who McMuffin is. But if any Republican politician endorses or campaigns for him, they’re committing suicide. Trump probably won’t win but he at least gave the globalists the throat punch they so richly deserved. The neocons took over the GOP and now they don’t like it when Republicans took it back from them. Yeah, that and a five-spot will get you a cup of coffee. Trump has done nothing to advance conservatism. He doesn’t even know what it is. But,oh, boy! He sure stuck it to the establishment by getting those rubes in flyover country to vote for him! And we’ll now have at least four more years of Mrs. Clinton, if she lives that long. Yeah, that Donald was just what the doctor ordered. I see a lot are agreeing with me about Free Republic supporting Trump for the most part, especially after the purge. As for McMullin’s chances, Never Trump has always been much larger than recorded due to all media being dedicated to getting him the nomination for different reasons. Mormons aren’t the only ones very interested in having a conservative they can vote for. I’ve been a chumpishly reliable Republican voter since 1994, but it’s over. I’m not a Trump supporter, and I think it’s unfortunate that he’s the nominee, but I’ll be damned if I’m going to go along with the Rick Wilson wing of the party or its odious agenda ever again. So best of luck with the “purge,” assholes. You have no idea how many people you are alienating permanently. You are like a guy who emerges from a couch, looks around and sees his wife had packed up and left, and then yells in a drunken stupor – you come back here this instant, or we’ll separate. Good luck on that. You own it. Anyone who believes that “anti-Trump Republican consultant Rick Wilson” is a conservative or a Republican, please tell me what makes you think that is the case. Secondly, what has Evan McMullin and friends done to stop Obama’s agenda during the last 7 years? It’s been the Party of Strom since Nixon. Ike was the last Party of Lincoln president.